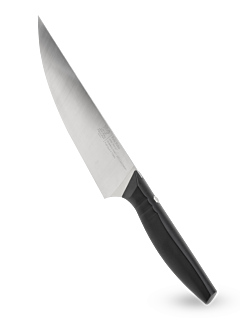 In kitchens all over the world, if there is an indispensable and universally acclaimed knife, it is the chef's knife. That's why Peugeot has designed a versatile knife, ideal for all types of cutting. Entirely designed and made in Thiers, home of fine French cutlery, the Peugeot chef's knife has established itself as an essential tool in every kitchen, as much for its versatility as for its ergonomics and contemporary design. Its blade is particularly hard and robust, even when being sharpened, 15 or 20 cm in length and forged in a steel alloy with 16% chromium. It has an ideal point for precise chopping and slicing, a middle part for regular chopping, and a third part, close to the bolster, specifically designed for cutting the toughest of ingredients. The spine of the blade is designed for breaking small bones. The Peugeot chef's knife is easy to handle, very precise, ergonomic and very comfortable to use, thanks to the perfect balance between the handle and the blade. It is a must-have piece of equipment for both keen amateur cooks and professional chefs.